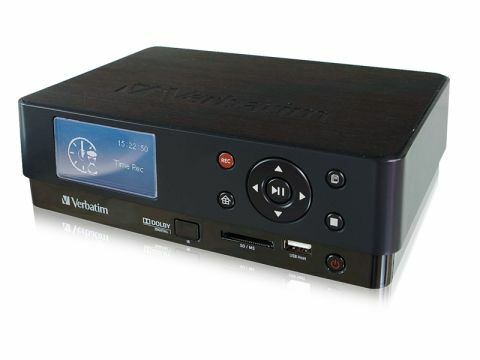 We've seen media streamers from a range of storage and networking specialists, but Verbatim's MediaStation HD DVR isn't just an exercise in bandwagon-jumping. Combining a multimedia player and recorder with a DVB-T/analogue hybrid TV tuner, built-in NTFS-formatted SATA hard drive and wireless networking with a good balance of format support and connectivity, it seems to justify itself pretty well. Socketry includes an SD/MS card slot, USB and USB Host, component video out, an HDMI 1080i out, LAN, coaxial, optical and RF. A remote control, a bundle of cables and a software disc including Nero MOVE IT software are provided, and the package we reviewed included the optional wireless USB dongle. An onscreen display offers five main options; TV In, File copy, Setup, Browser and Timer. Features include recording, storage and playback of TV broadcasts; upscaling to HD during playback; one-touch and scheduled recording using an EPG; time-shift recording; image photo back up from the memory card slot; media playback from the card slots or USB; H.264 playback from PC via the provided Transcode Server software; and streaming media playback via Ethernet and wireless LAN. It's well-constructed and with a practical remote control, the MediaStation combines some of the best features of the WDTV and Popcorn Hour devices. File support is extensive. It can play back MP3, WMA, WAV7/8, OGG, AAC, JPEG and BMP; and MPEG-1/2/4, DivX 3/4/5/6 and MP4 AVC (H.264) via the supplied Transcode Server PC software. There's a choice of 500GB and 1TB hard-drive sizes and packages with or without the wireless dongle. Sadly, it supports 1080i output but not 1080p as well as many video formats are only supported if streamed from a PC via the Transcode Server software added by an update. Also, the GUI graphics are a bit primitive.